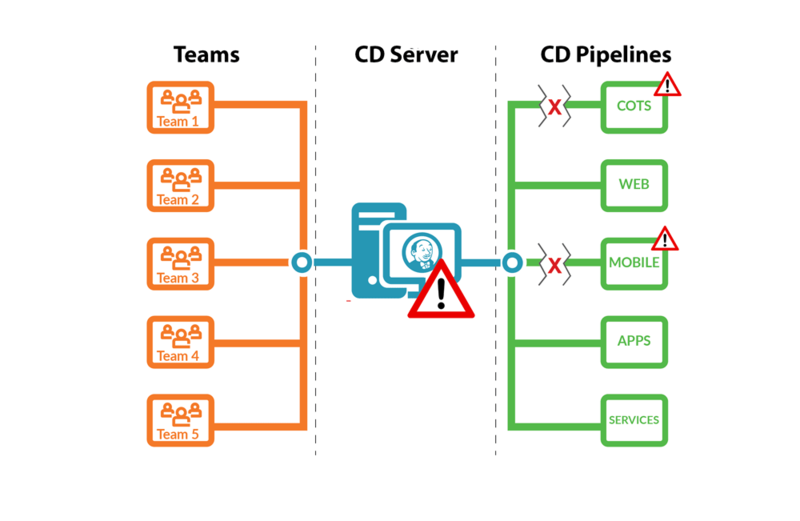 More teams means more instability of the CD server, less speed, and an inability to update business-critical services. This can be helped with CD as a Service. We recently launched to enable enterprise-wide DevOps through CD as a Service. Why is this important to you? Simply put, the results are in. Organizations that implement Continuous Delivery (CD) in support of enterprise-wide DevOps see significant improvement in release frequency, cycle time, and mean time to recovery. More importantly, such improvements lead to a more Agile, more responsive, more competitive overall business. To successfully implement Continuous Delivery and DevOps in a large, mature enterprise, there are specific needs and obstacles which must be addressed. Let’s look at them. Support for heterogeneous tools and practices to enable integration across the organization’s entire technology portfolio. Resiliency and high availability to prevent disruptions in the delivery pipeline of business-critical applications. Enterprise security and compliance capabilities to protect valuable intellectual property and ensure adherence to the organization’s established standards. Ability to unify process across multiple disconnected silos so that teams and stakeholders can deliver software rapidly and repeatedly. Traditionally, meeting the requirement for scalability has been the biggest challenge. Much of this has to do with the way Continuous Delivery has been adopted and the nature of the available CD solutions. Lightweight, single server web applications not architected for large scale deployments. Public SaaS solutions which are cloud-based but, implemented on the same single server model as the web applications. On a shared single service instance, the increasing workload overwhelms the server. The result is downtime, slow builds, compromised data and broken pipelines. As teams stand up their own instances, infrastructure costs increase. The ability to share practices is limited, and you have developers acting as tool admins. Single-server cloud instances address the infrastructure cost and reduce administration overhead but still suffer from disconnected teams and carry the risk of having critical data and processes off-premise, controlled by a third-party. CloudBees Jenkins Enterprise enables you to scale without instability by implementing the only solution with a Distributed Pipeline Architecture (DPA). To better understand DPA, it helps to look at what happens when traditional solutions scale. When we setup CD for a single team, things look good. We can deliver a single service through our CD pipeline with speed. As we add teams, the instability of our CD server increases. Our speed decreases. We are unable to update business-critical services. Single server, single point of failure. 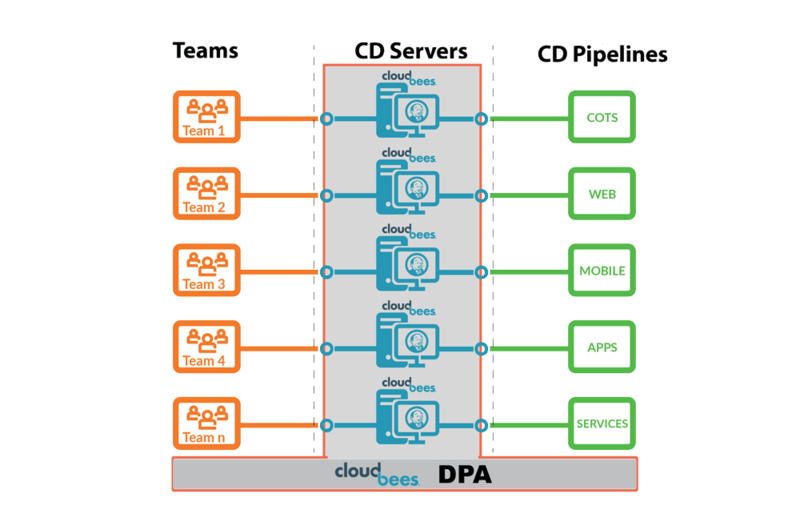 The elasticity of the Distributed Pipeline Architecture distributes teams’ CD workloads across multiple isolated servers, providing high levels of scalability. Now multiple teams using multiple pipelines can deliver multiple business-critical services reliably. Scaling with DPA enables speed and stability. Integration of all of your tools and processes. Leverages the vast ecosystem of Jenkins 1,200+ integrations, the CloudBees Assurance Program then curates and verifies the top ones. Reduced infrastructure costs. Dynamically allocates appropriate resources providing a high-density and very efficient use of infrastructure. Secure project isolation. Each team, project or application can have their own execution environment, keeping projects and data fully secured and isolated. Fault tolerant and self-healing. Build services that have stopped are detected and restarted automatically. Business continuity. CloudBees Jenkins Enterprise automatically handles real-time backup of the entire platform and fully automates the recovery process. Centralized management. All management activities can be performed centrally thanks to CloudBees Jenkins Operation Center, providing a very low cost of ownership. The launch of CloudBees Jenkins Enterprise is important to you because enterprise DevOps built on the practice of Continuous Delivery is how you remain competitive in today’s market. To do this you require the scalability, security, manageability and resiliency provided by Enterprise and the only Distributed Pipeline Architecture. 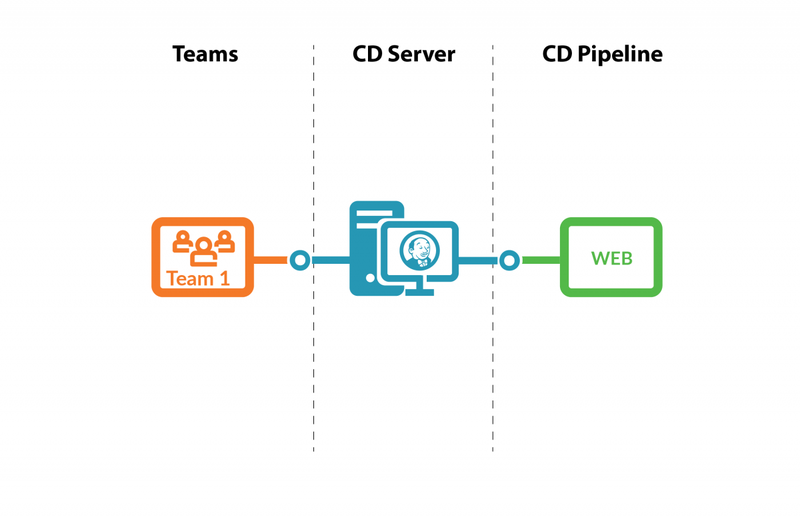 Deploy CD as a service in minutes on your existing infrastructure.